Running was a little tough yesterday. I am not sure why it was so difficult, but I was definitely struggling with my breathing while I was on the treadmill. I set the incline at 1.0 and just played with the speed to keep things interesting. But I only lasted 3 miles. Finishing up my workout on the elliptical made me feel a little bit more accomplished than just a three mile run, so I was glad that I did that. Plus I had skimped out on crosstraining on Monday due to the exhaustion, so it was definitely a good thing to get done! The afternoon workout was an old one (from April!) on that crossfit blog that I follow. 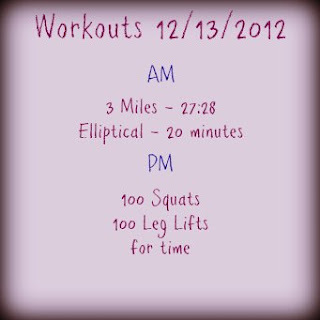 It was a tricky one and it had my abs burning at the end. I searched on you tube to figure out which variation of "leg lifts" they likely meant for this workout, and I ended up with the lay on your back and raise and lower your legs until they are almost touching the ground to work your lower abs. There's my results from the workout. I was pleased with the time overall, and doing these little workouts definitely makes me feel strong, as silly as that may seem. I know that even though I am just doing these little workouts, I am definitely doing more strength training than I did for most of 2012. All of the marathon training/running took the strength right out of me! I have started looking at my race calendar for next year. Nothing is definite as of right now, but I am definitely getting there and coming up with some ideas. I noticed that ZOOMA Annapolis happens to be when J will be in Washington DC for work, so that is becoming a possibility for me, which I thought a ZOOMA race would be WAY in the future if ever. I am definitely hoping to do more shorter races. I have a 10K PR that definitely needs some busting. I just hammered out a new 5K PR, so it would be nice to get that once shattered again as well, but I also know it is not that likely because that was REALLY tough for me. What races are on your calendar next year?